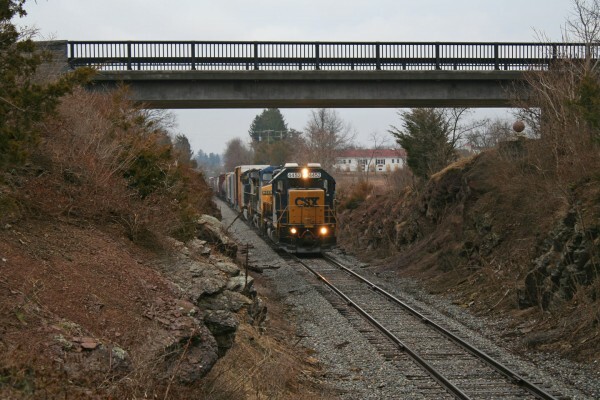 The CSX Hanover Sub runs from Baltimore to Hagerstown over former Western Maryland lines. It’s, essentially, a long branch line with no through traffic. 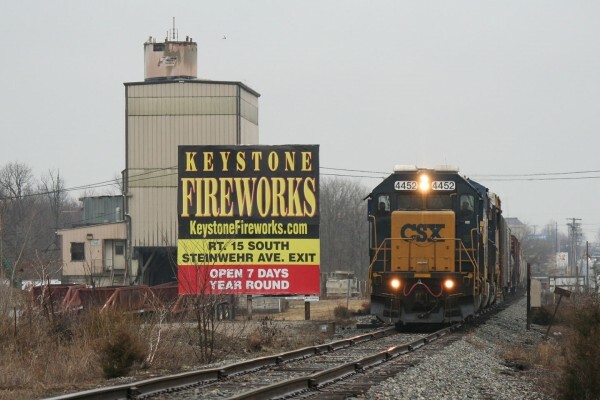 It is, however, scenic and full of interesting railfanning opportunities. Our trip started with some research, and thanks to some good info, we put together a good plan of attack. 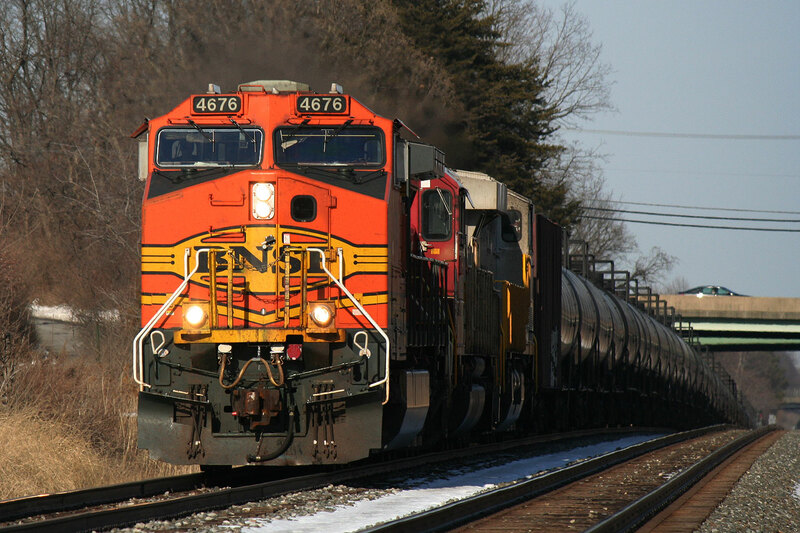 We were going to get started at 7am, and head west to Hanover, where the crews for the trains on the line go on duty. Train D795 goes on duty at 8am, and usually does some work east of town, picking up cars from Yorkrail at Porters, and then heading west. We caught up with him at the quarry in Bittinger. As per usual, the weather wasn’t completely cooperating, and we were fighting rain and cloud during the entire trip. At least we could hide in the car. The poor conductor was in for a wet day though. While we were unlucky with the weather, we were rather lucky with the power. 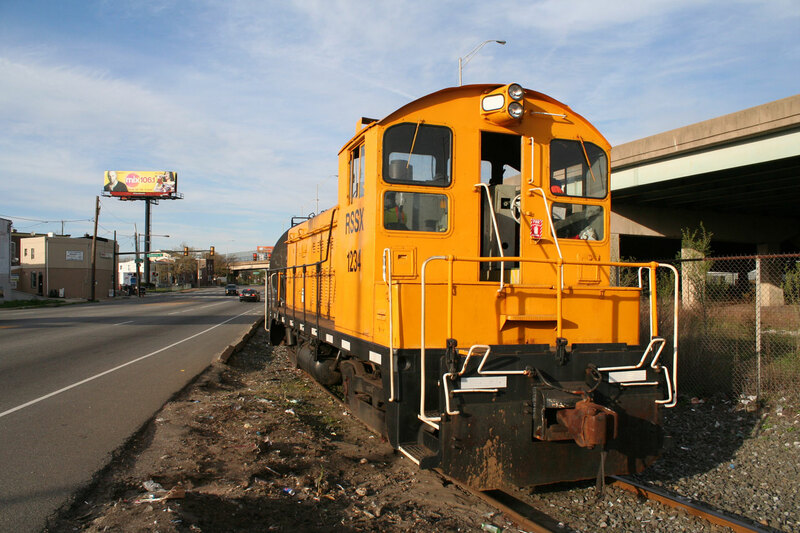 Up until a few years ago, stuff bigger than an SD50 was banned on the Hanover sub, but some recent rail replacement work changed all that. We got lucky though, and caught a GP40-2 up front. 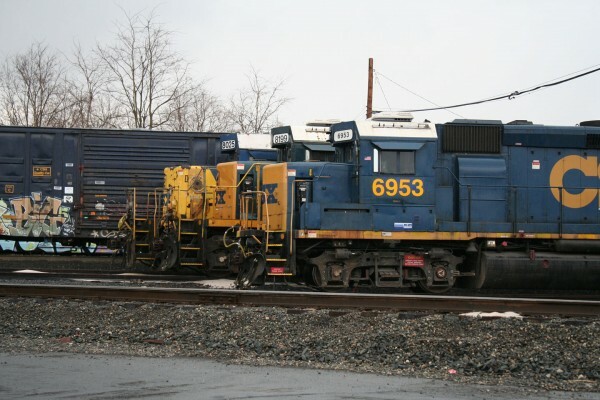 CSX D795 works at the quarry at the Bittinger quarry. While we were waiting for him to get moving, we put together a plan for the next leg of our journey: head up to US 30 and chase him west. Our first photo opportunity was in the town of New Oxford. There’s a small station and museum type thing there, and we figured this would make a good photo prop. At this point, it was raining pretty decently, and it was a bit of a struggle keeping the lens clear of water drops. From New Oxford, it was back on the road, to the crossings just a bit west of town. While we were looking for a good spot, he got by us. We pressed on to Daltile, the train’s next stop to the west. There really wasn’t a great photo angle, but it was fun watching them run through some guy’s back yard and pickup some cars. D795 using a boxcar as a reach car to lift a pair of of covered hoppers. 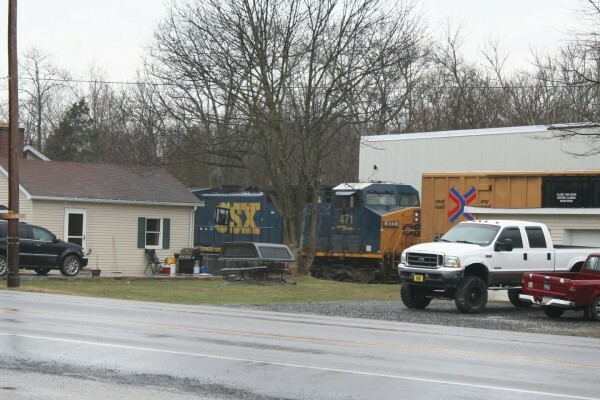 When the crew got the picked up cars back to their train, we headed off to the Granite Station Rd crossing and the interesting AG Com facility. The AG Com elevator at Granite Station Rd. We waited around for just a few minutes before the train showed up. The switches for the plant are on the east end, which meant that the local would work it, if it were going to, on the way back to Hanover later in the day. 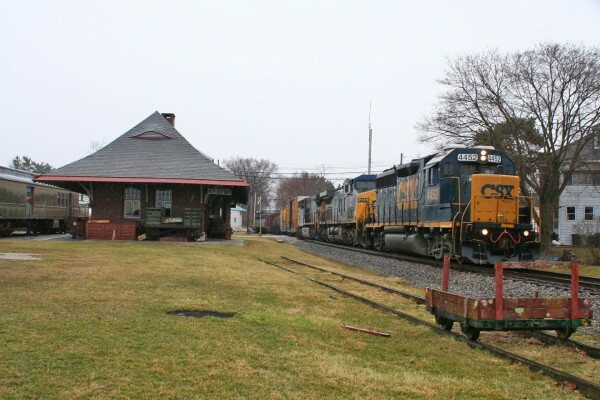 D795 Passes the AG Com elevator complex on the eastern edge of Gettysburg. It was then off to the long straight-away just outside Gettysburg proper. I really like scenes like this, and the long straight gave me time to get two good shots. D795 passing some of the commercial development on the east side of Gettysburg. The train beat us through Gettysburg itself, denying us the interesting opportunities there (we’ll just have to go back), we did catch him on the west side of town, in the midst of the battlefield. Of course, the karma resulting from our joking about the monument resulted in our not getting the shot we really wanted here, with the power about 3 cars further back. He was stopped at this location, making a pickup from the Gettysburg & Northern interchange, and had originally pulled forward, and then backed up. D795 shoving back to make his pickup at the Gettysburg Northern. He did back up far enough for me to get a shot from the bridge though. 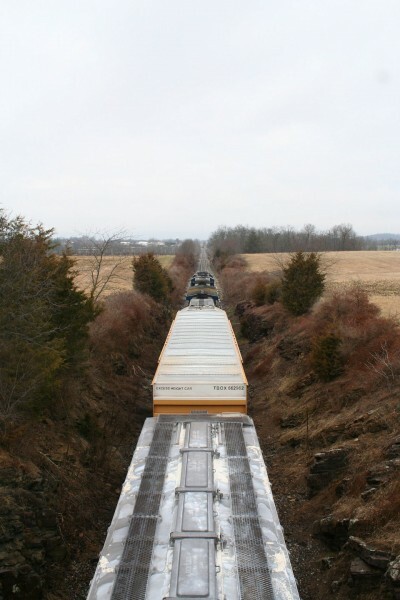 CSX D795 in the McPherson Ridge railway cut which was the seen of heavy fighting on the first day of the Battle of Gettysburg. I found a way down into the cut, and lined up a shot of him departing. 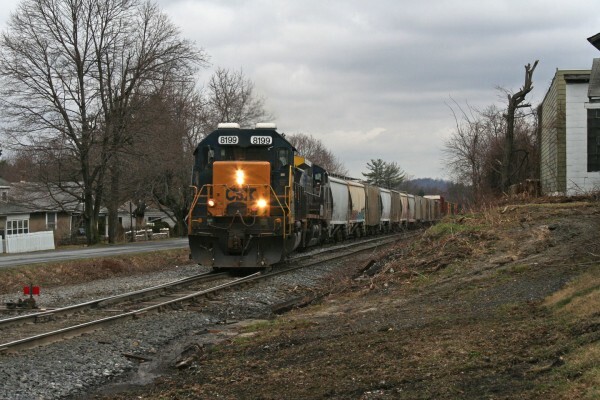 We chased him west on Route 30, until the tracks turned south towards Hagerstown. We beat him to the town of Orrtanna, where we caught him passing through “town” and past the fruit packing plant there. From Orrtanna, it was open country and we could keep a decent eye on him for a little bit. As I drove along, I tossed my camera to Ben, who was riding shotgun and hadn’t brought his own camera, and told him to start shooting. This was his first shot. Not bad! We then proceeded to chase him up Jacks Mountain, and beat him to the summit. We were hoping that, at this point, we’d catch him really working his guts out, but with three units (including two AC4400s), and only about 20 cars, the “mountain” was no real challenge. 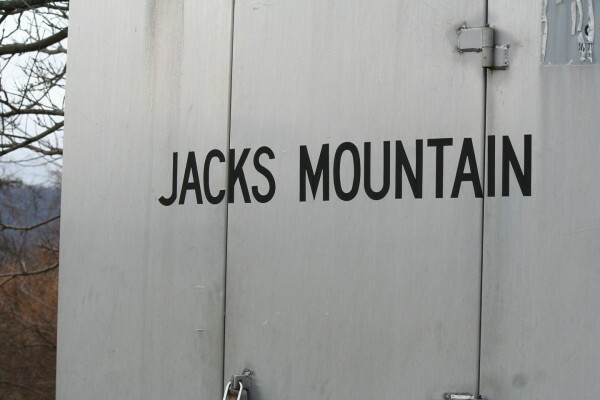 D795 easily crests Jacks Mountain. 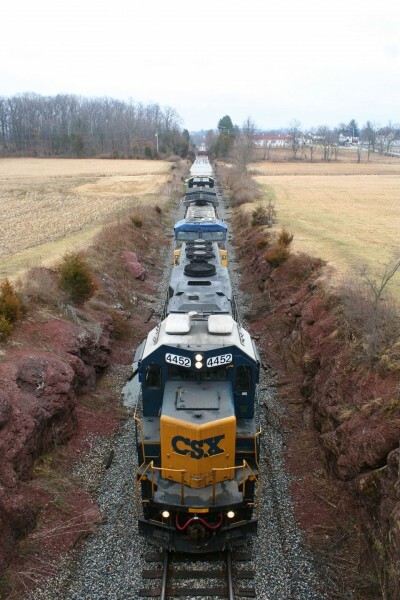 We then pressed onto Blue Ridge Summit, where we were hoping to catch him interchanging with the Maryland Midland. We also planned on stopping at Mainline Hobby Supply to do a little shopping. 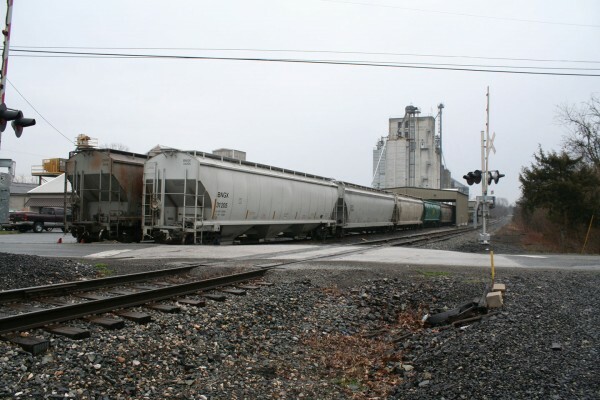 We arrived in town, expecting to see the train approaching, and hoping to catch the MMID there, but what we saw was something completely different. 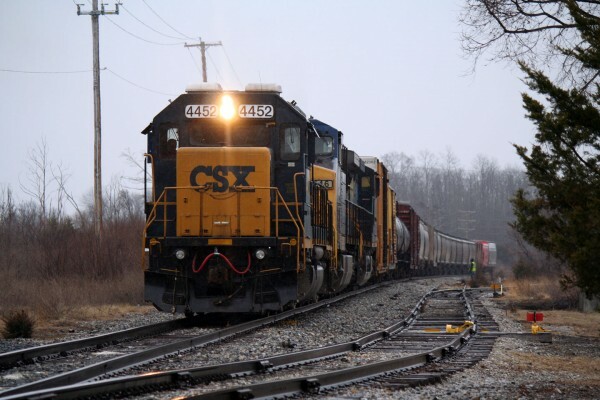 There was a completely different CSX local in town, that looked like it was finishing up picking up the MMID stuff. These guys were just finishing up, and were getting out of town as we arrived. 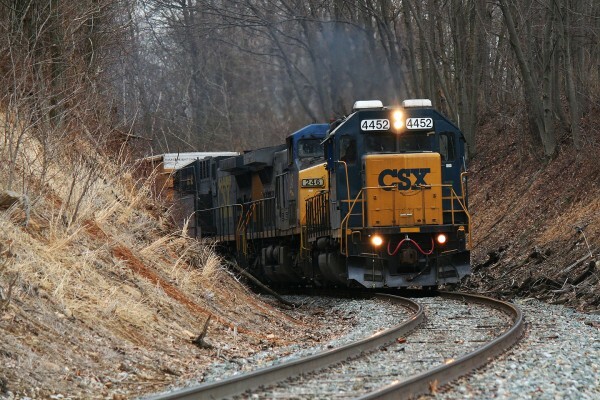 Unknown CSX local getting ready to leave Blue Ridge Summit. After the local left, we headed to Mainline Hobby and then lunch at Chapin Gray’s Grill, which is a real jewel. It feels like you’ve stepped back in time there, but the food is delicious. When you’re in town, you should definitely go there. Our next stop was Hagerstown, where it rained, and we saw some things moving, but mostly just did some sight seeing. 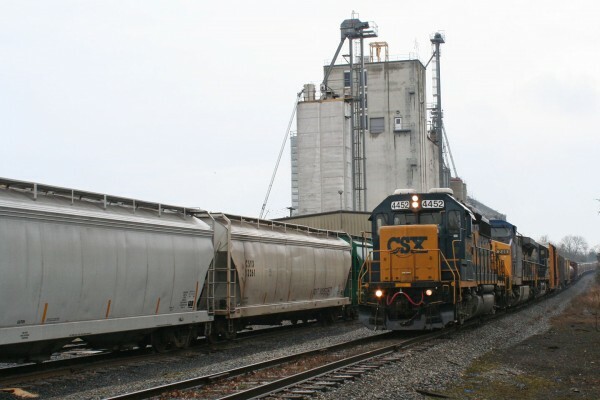 That sight seeing included swinging by the CSX yard there, where we caught some power sitting around. 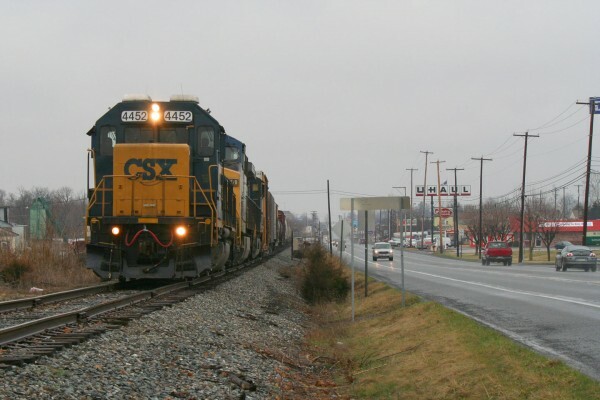 CSX power lined up in Hagerstown. 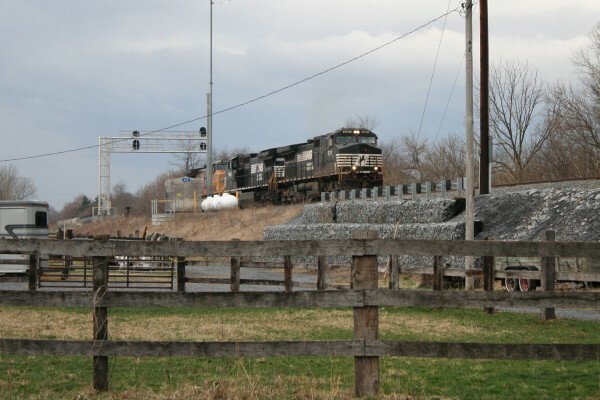 Since D795 had slipped through our grasp by this point, we moved onto our plan for heading back towards home: checking out the NS Lurgan and CSX’s intermodal terminal in Chambersburg. 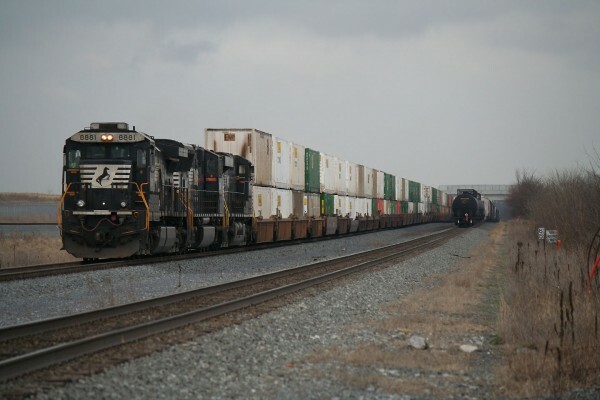 We saw some NS stuff moving in Hagerstown, but couldn’t get ahead of them, so we headed north to Greencastle, NS’s large intermodal facility on the Lurgan Line. 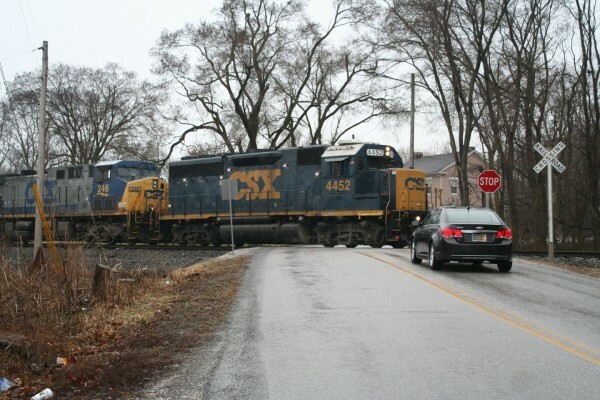 We got ahead of the train we saw, but someone else got out ahead of him: some light power (probably heading to Enola). A little Google Maps scouting found us a location across from the yard that had track access. 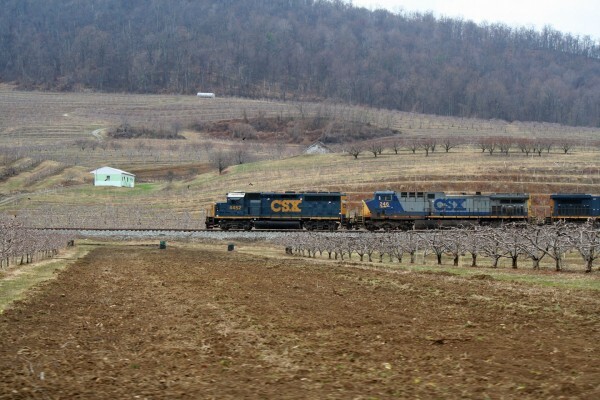 We headed that way, and saw the tail end of a southbound manifest train, and the head end of the northbound intermodal we had seen back in Hagerstown. This guy seemed to be taking his time, so we moved on towards Chambersburg. 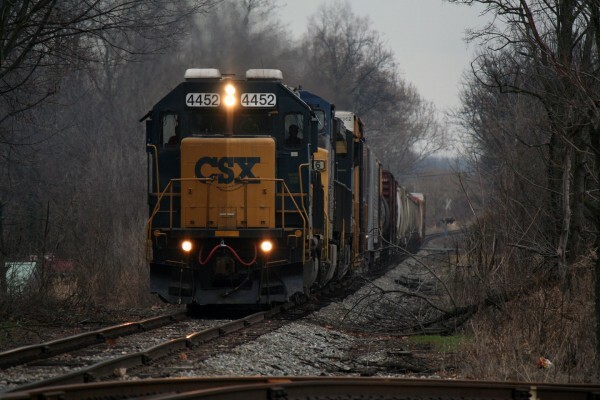 We could see the CSX facility, but there really weren’t any good photo locations, so we posted up at the grade crossing on the south end of town, and waited for a train we saw in a siding to come our way. 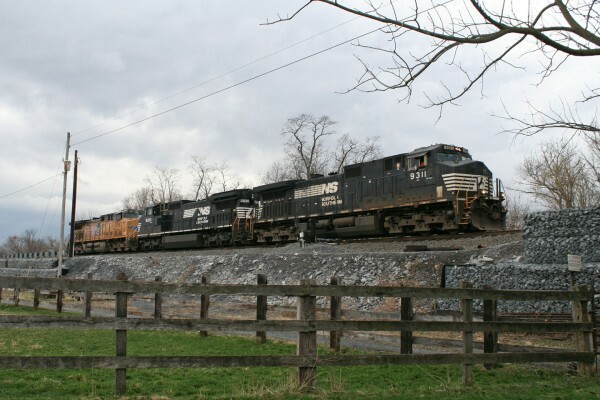 We had assumed he was waiting for the intermodal we saw, but as we pulled into the lot, the gates were coming down, and we were surprised by a southbound empty coal train at track speed. 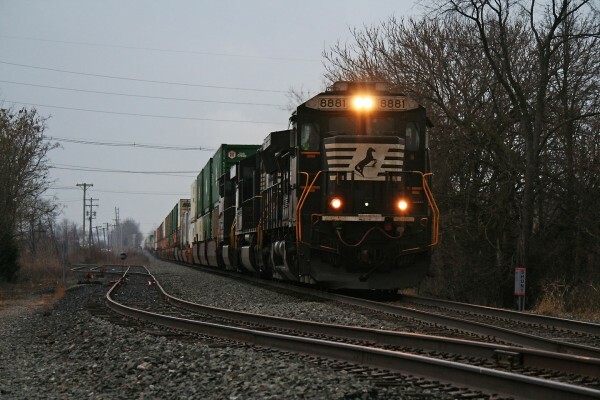 We waited around for a while since the signals had cleared up, but instead of the waiting southbound, we again caught the northbound intermodal we had already seen. That was it for us for the day. Despite the crappy weather, it turned out to be a great trip. We saw some stuff in new locations, and had a great time out in the country. One of the funny things about this trip, though, was that it probably wouldn’t have been nearly as good if the weather had been sunny. 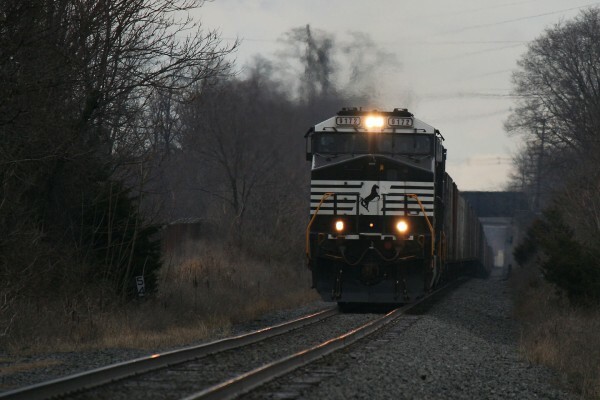 Since the CSX local that we were chasing runs against the sun (west in the morning, east in the afternoon), we would’ve been shooting into the sun all day. I’ll take the gray skies over that any day.